It can be quite handy to have a portable version of a popular antivirus software in reach, as it provides several advantages over installed applications. It is first and foremost possible to initiate scans right away on a computer. This can be extremely helpful if malicious software has damaged the system, or added protections that prevent software installations or installed software from running. A second advantage is that you can put the application on a USB stick to have it always with you. You can then use the portable software to scan computers at friend's houses, or public computers before you use them. SuperAntiSpyware is highly regarded in the security community, and more than 30 million users should speak for that as well. The program is offered as a free and professional edition. 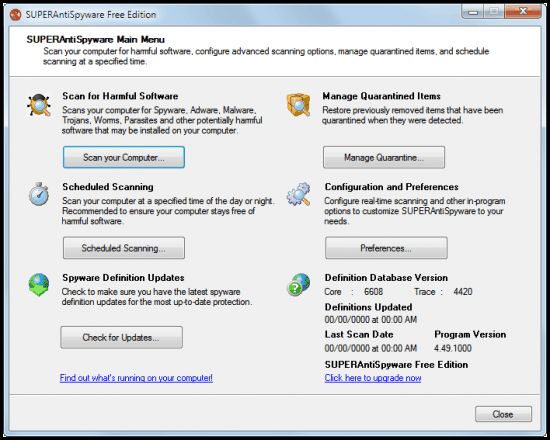 The free edition can scan all drives, the memory and files on the system. 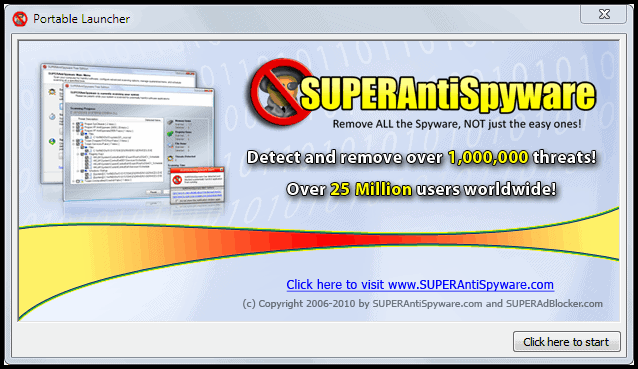 It detects all existing threats just like SuperAntiSpyware Professional. The professional version on top of that adds heuristics, the detection of threats that are not yet known and included in the program database, and additional options like scheduling, automatic updates or real time blocking of threats. 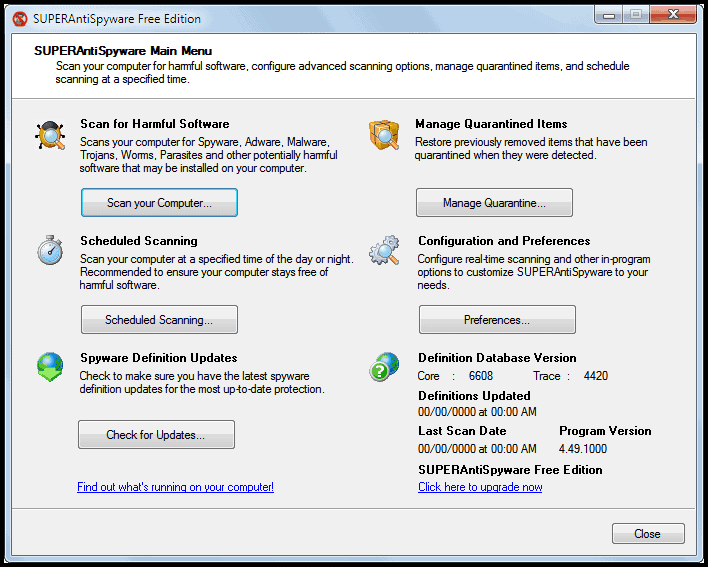 SuperAntiSpyware Free is offered both as an installer and portable version. The two versions are identical in features, with a few exceptions. The main difference is that the portable version can be run right after download, and that it keeps everything in memory. The program is offered as a com file, probably to give users the chance to run it if malicious software blocks exe files from running. The download page states that the program comes with the latest definitions, a quick check revealed that this does not always have to be the case. The program after download displayed a definition database version of 6608, an update brought that to 6636. This may be a technicality though. About updates. The check for updates button works and will install the latest definitions on the system. Install? At least the program directories in the user folder are created or modified (the directory could have been a leftover from a previous installation, today's data was however displayed as the creation date.). I was not able to find the database files which could mean that they are loaded to memory only. This was confirmed with a restart. The old database version was displayed again after the restart. It is recommended to press the check for updates button before you run a scan. The functionality of the application is in all regards exactly the same with the exception of the quarantine. It is possible to perform a quick or full scan of one or all drives that are connected to the local computer system. Threats that have been detected can be removed but not quarantined. The program description is in this regard confusing as appears to support the quarantine when in fact it is not. Quarantined items are only stored in memory. No items are stored in the quarantine over sessions. Users need to keep that in mind since it makes it impossible to restore a false positive after the program has been closed. But that's how other most portable solutions and antivirus Live CDs work. A useful utility for double checking, but my interest was in the portable version, which IMHO isn’t – portable that is. Portable to me doesn’t just mean installation free, it means not leaving files on other media, and the first run of this application left files on my boot drive, in both Program Files and in the User area. Nice idea, but not for me. Ditto Jack’s comments. This app has always been intrusive in it’s installed form. It leaves a lot of junk behind at uninstallation – including hard-to find non plug’n’play drivers, and many registry entries. And of course, there’s the folders it creates in it’s (supposed) portable form as Jack has said. I won’t use it again unless they address this issue. There are other options.